And this surprises who? 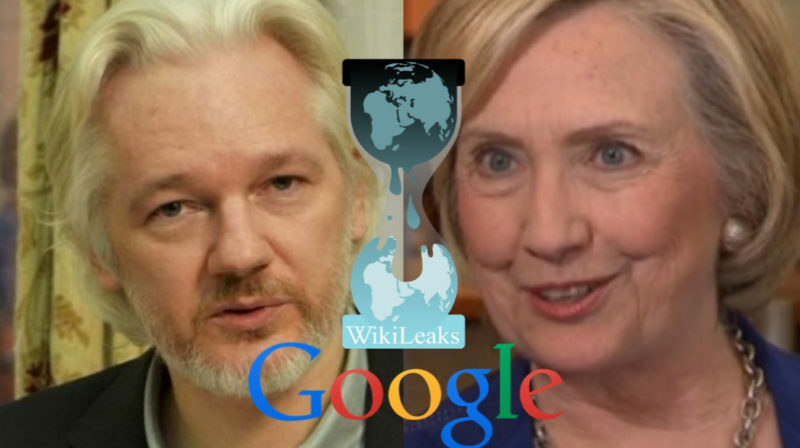 Hillary and Google are both on the very same team… the starting lineup for our globalist masters. You can do your own test. Go to Google and search Donald Trump. The top result is always a negative headline from a liberal outlet. Do the same for Hillary Clinton and it’s always a positive headline from the same outlets. Recode: Julian Assange is no Google fan. He doesn’t like Hillary Clinton much, either. And early yesterday morning, the founder of Wikileaks was supposed to unleash a fresh batch of leaked (or stolen) documents intended to upend Hillary Clinton’s presidential prospects. Pro-Trump enthusiasts branded the announcement as a can’t-miss occasion that would change the tide of the neck-and-neck race. But that didn’t happen. Instead, he plugged his book and promised that more documents will be released every week until Election Day, Nov. 7. The documents, Assange said Monday night, will expose damning evidence against a range of powerful entities and issues, like the military, the oil industry, the U.S. presidential race and Google. Assange’s problem with Google traces back to Eric Schmidt, the former CEO of Google and current chairman of the board, and his ties to the State Department when Hillary Clinton was secretary of state. The Wikileaks founder never liked Google, as a longtime an advocate of a decentralized internet, and he’s also railed against digital surveillance for decades.